The Scorpion S-4020 series of motors are built with 6mm hardened steel shafts that will last through countless hours of flying fun, but occasionally, on a "Less than Perfect" landing, you may bend or break one. For these occasions, we offer factory replacement shafts for all the 40mm Scorpion Motors. Our Motor Shaft Kits include an original equipment factory shaft with the setscrew keyways already cut, a new shaft retaining collar, and a replacement setscrew for the retaining collar. 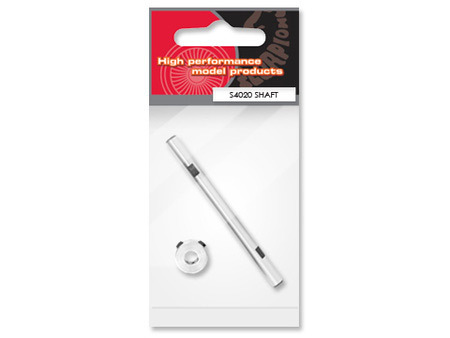 The shaft for the 4020 series airplane motors measures 6mm in diameter, and is 78.4mm in long. The shaft kit will also fit other brushless motors that require a 6mm shaft of this length. The shafts can be cut shorter with a Dremel tool and a cut-off wheel if necessary to fit other motors. They need to be pressed out in a bearing press, or in a drill press, with the front housing of the motor supported in a block of wood to prevent warping the front housing.